Thousands of anti-government protesters are rallying in the streets of the Pakistani capital for a second day despite early-morning clashes with police who fired off shots and tear gas to disperse the crowd. Thousands of anti-government protesters heeding the call of a firebrand cleric rallied in the streets of the Pakistani capital Tuesday for a second day despite early morning clashes with police who launched tear gas and fired shots into the air to push back stone-throwing demonstrators. The protest called by Tahir-ul-Qadri, who has rocketed to national prominence after his return from Canada late last year, has galvanized many Pakistanis who say the current government has brought them only misery. But critics fear that Qadri and his demands for election reforms may derail the country's upcoming democratic elections, possibly at the behest of the country's powerful military. During an early morning speech, Qadri called for the government to resign and called on his followers to stay in the streets of the capital until their demands are met. Many had brought blankets to ward off the cold and slept there overnight. "I give you time ... to dissolve the national and all four provincial assemblies otherwise the nation will dissolve them on their own," he said. He vowed to address his followers again Tuesday. Qadri has issued numerous vague demands for electoral reforms, such as vetting political candidates to make sure they're honest and restructuring the system so that the common people have more opportunity to take part in politics. He has likened his protest movement to the popular Arab Spring uprisings that overthrew longtime dictators in some Arab countries. But his critics argue that while Pakistan's government is flawed it is still a long way from the once-deeply entrenched autocratic regimes of countries like Egypt and Tunisia. Nonetheless, his anti-government barbs — that it is corrupt and incompetent for example — hit home with many Pakistanis. Five years after Pakistan's return to democracy from military rule, many are furious at the power outages, terror attacks and unemployment that continue to plague them. "This system has rotted. It has to change," said 29-year-old Iftikhar Ahmad, who traveled to Islamabad from the eastern city of Sargodha. "I am going to stay here ... even if I die." Many protesters like Saqib Sultan, from the eastern city of Lahore, brought their families and slept on the road. "My wife is here with me, my children are here, and I am here," he said. Like many others, he vowed to stay until their demands are met and called this "the last chance to save Pakistan." The determination of marchers and organizers has put them into confrontation with the government, which has strongly opposed the rally. The protest has been largely peaceful ever since demonstrators set off from Lahore Sunday, but the underlying tension was evident Tuesday morning when police and protesters clashed hours after Qadri's speech ended. Each side blamed the other. Television footage showed police shooting into the air to push back protesters and a man on the ground being beaten by people who appeared to be protesters. Demonstrators threw rocks at a vehicle, while others held up bullet casings and an empty tear gas canister. In an email to The Associated Press, a spokesman for Qadri, Shahid Mursaleen, blamed the entire incident on the security officials and said police had tried to arrest the cleric and opened fire without provocation. Thousands of people remained on the streets after the clashes stopped. One city official put the number of protesters at roughly 30,000. He did not want to be identified because he was not authorized to speak to the media. 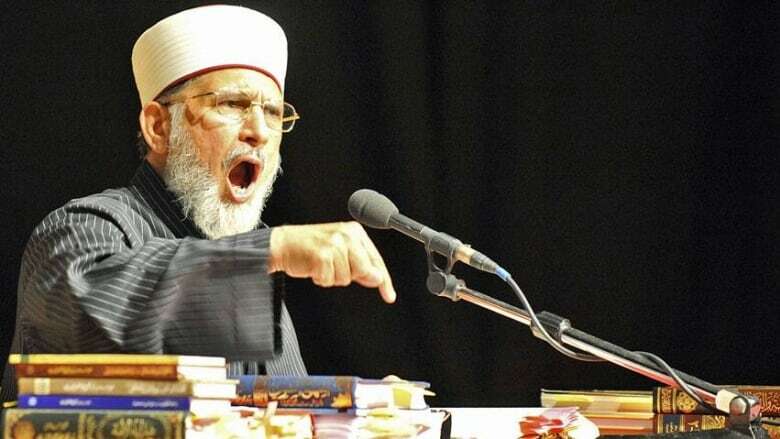 Some of Qadri's reform proposals have sparked concern that the cleric is being used as a front for the Pakistani military to derail the upcoming vote, just as the country — which has a history of coups — prepares for its first transfer of power from one civilian government to another. Qadri's apparent rise to a national political force in a matter of weeks since his return from Canada have also raised questions about whether he's been getting outside funding. The government has painted Qadri as a menace to the country's fragile democracy. Fawad Chaudhry, an adviser to the prime minister said Tuesday that Qadri's demands are a revolt against the state. "Thirty thousand people cannot be allowed to take hostage 180 million people," he said. Qadri has called for a military role in picking the caretaker government that will take over temporarily ahead of elections, and has said it could stay in place longer than normal to enact necessary reforms. The military is widely believed to dislike both the main political parties vying for power. Qadri has denied any such military backing. Elections are expected sometime this spring.